Thank you ladies for showing new to Clemson Girl, Passionately Rivalicious, such a warm Clemson welcome today! We loved reading all of your comments on their Facebook page. Congrats ladies!! 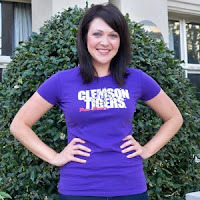 Please email us (clemsongirlblog@gmail.com) to claim your awesome prizes! Special thanks to Passionately Rivalicious for sponsoring today's giveaway!